Trying to find some books about Iceland proved a little bit more difficult than I would have thought. Maybe the task wasn't supposed to be as difficult as I found it to be, but it did take a significant amount of web browsing to collect the following titles. 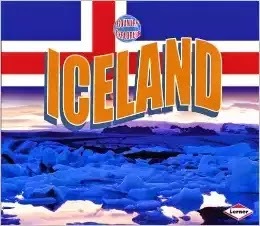 We thought we'd share them with others, just in case you too are planning a trip to Iceland, and/or are learning more about the country for a geography study, and/or because you want to know more about this land where Vikings made their home. We have several of the Country Explorer books so it made sense to add the one on Iceland to our home collection. This book, like the others, give a great overview of any given country such that kids can understand and connect to the culture. The layout is almost scrapbook in nature, with a photograph or two per page with an accompanying paragraph of information. 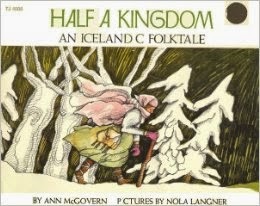 Half a Kingdom: An Icelandic Folktale is a very fun book to read. It tells the story of a king who is in love with his wealth but who must face giving away up to half of his kingdom once his son, the prince, is discovered missing. He offers this reward to the person who can find his son and return him to him. Wise and strong men search far and wide for the missing prince. Signy, a poor peasant girl, figures that if everyone else has searched far and wide for the prince with no luck, she will try looking for him close and near. As you might guess, it is she who finds the prince and helps to rescue him from his captures. It is a happily ever after sort of tale. 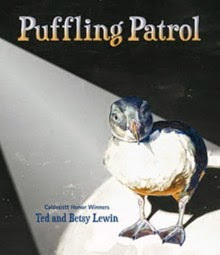 Puffling Patrol is a true story written by Caldecott Honor Winners, Ted and Betsy Lewin. Every April, the Westman Islands off the coast of Iceland become home to a vast number of puffins. In August it is time for the young Puffins to make their own way in the world, but some begin their travels by landing in town instead of flying out across the ocean. There is an organized group of children called The Puffling Patrol who search at night for lost baby puffins. They collect the pufflings and then take them back to the sea where they give them a hand taking off, this time in the right direction. Bookworm1 hopes to catch a glimpse of puffins while on our travels. And yes, he is aware of the fact that Icelanders also eat puffins. 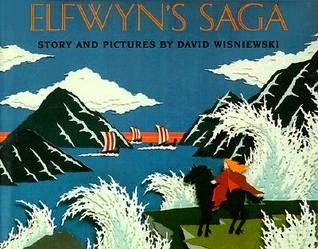 Elfwyn's Saga , by David Wisniewski is no longer in print but you can still find used copies on Amazon. This story is drawn from Icelandic history and legends. We meet Elfwyn who is the recipient of a curse laid upon her family but a rival, Gorm the Grim. Although she is blind, the Hidden Folk have blessed her with the gift of "second sight" and allow her to see things that others cannot. As a result of her blindness, she avoids falling prey to Gorm the Grim and saves her family and the kingdom from complete destruction. I liked this story quite a bit but I don't think the kids were as "into it" as I was. The childrens' favorite books were the one immediately above and below. 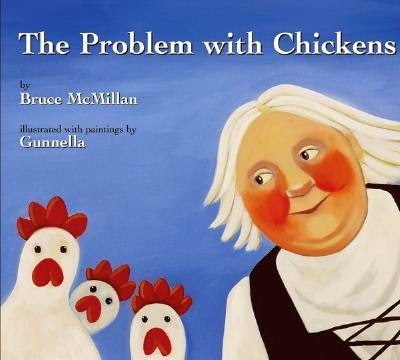 They really enjoyed The Problem With Chickens and How the Ladies Stopped the Wind . It should be noted that these books are written by an American author but they are set in Iceland. They are illustrated by famed Icelandic artist, Gunnella. In the first title we meet the ladies from Iceland who are having a difficult time collecting eggs for them to use use. They try collecting from the birds on the cliff but that proves rather problematic. So the ladies decide to bring chickens to the island to keep them well supplied with convenient eggs. The problem arises when the chickens begin thinking that they are humans and fail to lay. The ladies have to get a little crafty to get the hens laying again. 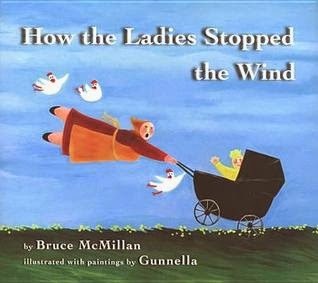 In the second title the ladies are back with their chickens, both being blown about by the wind which sweeps over Iceland. The ladies decide that they need to plant trees to help block the wind. The problem this time is that the sheep are eating up all of the saplings and eventually the ladies have to settle for trees growing up in town but not in the countryside. My kids absolutely loved these two titles. They giggled and laughed throughout the reading of both, leaving me with these words to say unto you: highly recommended. If any of you out there have some additional titles to recommend on or about Iceland that you have found particularly enjoyable, well, I'm all ears! Do share your suggestions in the comment section below. I think I might share the childrens' opinion and am curious how the Iceland native would have illustrated his/her homeland. I'm getting more and more excited for y'all and your trip. :D I love how prepared education wise you're getting for it, too.